mobile.de, scanner, search, locate, notify, motorcycle, car, truckch as mobile.de and autoscout24.de. When the new vehicle appear on the marketplace you will be notified using sound, SMS or email. 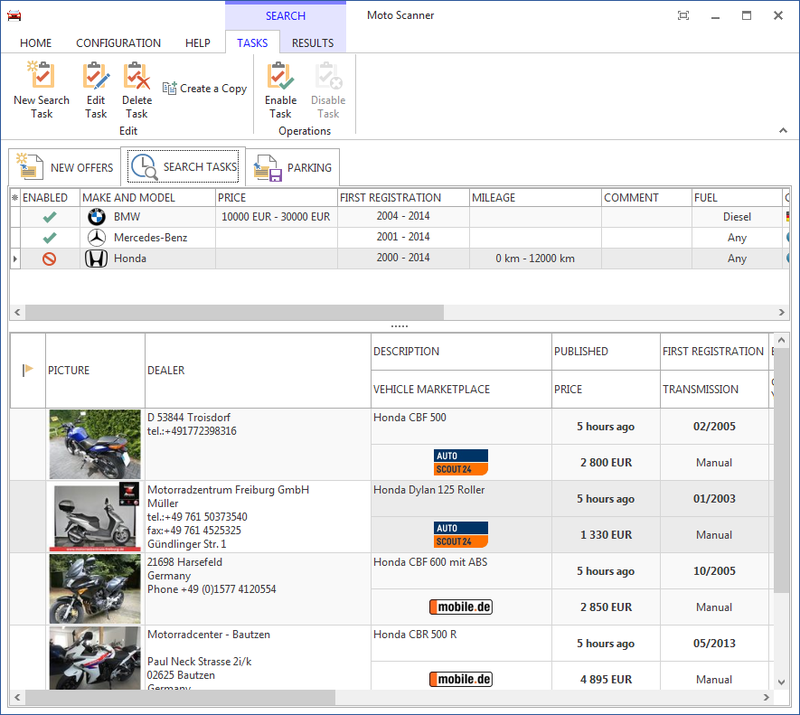 Moto Scanner is the program that automatically searches for vehicles on internet car markets such as mobile.de and autoscout24.de. When the new vehicle appear on the marketplace you will be notified using sound, SMS or email. The program searches for cars, trucks, buses, motorcycles and more. Easy way to define your search conditions based on: engine capacity, make, model, engine type, seller type, price, mileage, first registration and much more. Fast and intelligent search engine. Results are presented a few seconds after the car appear on the website.